Europe’s centre-left is rapidly falling out of love with the European single currency. Fifteen years after its creation, British journalists Larry Elliott and Dan Atkinson assess its performance to show why. Looking at a range of key indicators the authors show how the euro has failed to deliver on its promise of more jobs, more growth and greater equality. Instead it has undermined the European Union. Elliott and Atkinson compare the European Central Bank to the Federal Reserve, arguing that the architects of the euro subjugated economic measures to political considerations. Consequently, countries that didn’t meet the economic convergence criteria were still allowed entry. The end result is a dysfunctional currency union that is unable to cope with difficult economic circumstances. Assessing the situations in Greece, Germany, Italy, France, Ireland, and Iceland, as well as Britain, they show that the current policy of kicking the can down the road and hoping that something will turn up is proving increasingly unpopular with the currency’s one-time fans in progressive politics. This engaging and accessibly written volume will be widely read by economists, pundits, and policymakers as Britian considers its future relationship with Europe. All sides in the European debate call for various forms of 'reform'. Whatever one's standpoint, this new work by the tried and tested team of Larry Elliott and Dan Atkinson is essential reading on the problems afflicting the European Union, and possible solutions. 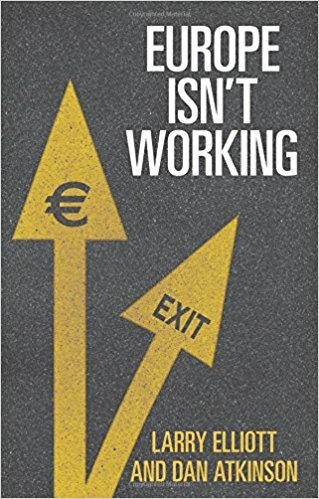 As the debate over the future of Europe rages, this is a brilliantly compelling book that exposes the terrible failure of the euro project. Elliott and Atkinson have done it again. This is a brilliantly written and powerfully argued attack on the Euro project. They can justly claim to have been members of 'the Few' who foresaw the disaster that the Euro would turn out to be. Now they are part of the even smaller number who recognize that the euro needs to break up.